Computer Science Poster Bundle - 5 sets of STEM posters! Computer science careers are booming, and more students than ever are learning to code. But why is computer science so important? 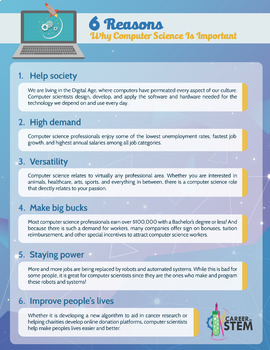 This poster summarizes six reasons why computer science is important. Never be stuck without an answer for the inevitable question - Why do I need to know this! Perfect for any computer science class, technology course, or any STEM class, or coding program. Help students see the relevance of computer science in their daily lives. Purchase includes page size (8.5x11) poster in PDF, JPG, and PNG formats. STEM Career List aligned with NGSS - FREE!